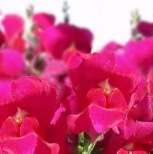 The showers purple snapdragon is a lovely little flower with the less than lovely botanical name of Antirrhinum majus. The plant will produce a low bushy compact growth with few branches from the base. Snapdragons are early flowering plants with a short season, but a good plant since while it does flower, it is among the most splendid garden varieties with an abundance of purple heads that resemble chinese dragons.